Home cinema projection perfection is out of reach of most wallets, but with entry-level models such as this Epson EH-TW2900 offering full HD movie flair in spades, who needs the high end? For a projector priced at just over a grand, the boxy EH-TW2900's features constitute some haul. Full HD resolution still comes at a premium in the projector world, but on this machine it's supported by a high contrast ratio of 18,000:1 and a 10-bit video processor. There's also an automatic iris, which should increase contrast further, and some nifty lens shift features so that it doesn't need to be placed head-on to a projector screen. But just as impressive is a three-year warranty on both the projector and the lamp. This is an effort by Epson to make projectors a less scary investment. What it does lack, in comparison to pricier projectors, is decent frame interpolation technology, which may make the EH-TW2900 susceptible to motion blur and judder when showing Blu-ray discs. Those features are controlled by an uncomplicated remote, though its idiot-proof layout and large buttons could do with a backlight. Fitted with dedicated buttons for each input, there are also shortcuts to both simple actions (switching the colour mode, aspect ratio and sharpness) to more complex menus (gamma and RGBCMY). The onscreen menus, while drab, are similarly easy to navigate, but instead of relying on the usual central left/right and up/down commands, they needlessly require constant pressing of an 'Escape' button to return to the root menus. While a lot of full HD lightboxes are designed for dedicated home cinema rooms, Epson's latest is well suited to all kinds of spaces. That's largely because of its 2.1x optical zoom and its lens shift system. Using manual dials on the projector's roof, the latter allows the image to be shifted up and down, and left and right on a vertical and horizontal axis. Moving the lens like this is much safer than tampering with the image via the keystone correction feature – the latter softens the picture. To help get the exact geometry, the EH-TW2900 even has a built-in pattern that can be briefly displayed while you're watching a live input. The projector's brightness does enable it to be used during the day, but you're still going to have to shut the curtains as tight as possible. There's a good reason for this model's generous dimensions: the large chassis funnels air while acting as an effective silencer. Its status as one of the quietest projectors around isn't interrupted by its automatic iris, which makes no discernible sound even on its high-speed setting. By monitoring and tweaking contrast levels on the hoof, the EH-TW2900's auto iris does help reveal a lot of detail within Dark City, our dingy test disc, though it's still an area for slight improvement. There's little to criticise when it comes to brightness; the unit is capable of producing stunning peak whites that lend a lot of power and accuracy to colour. An eco mode that slightly reduces the brightness is also available. During Dark City's murky pool scene, the bright close-ups of Schreber's face display accurate skin tones, though there are few details within the Stranger's long black coat. It's a more than adequate image, but a touch extra contrast and sharpness wouldn't go amiss. The ensuing chase scene on the stairwell reveals impressive stability; as the camera slowly pans around there is a sight loss of resolution, but it would be too much to call it blur. A frame insertion feature would help here, even though that risks introducing artefacts; here pictures are extraordinarily clean. The EH-TW2900's basic spec does have it downsides, though. As the camera swoops in on Dr Daniel P. Schreber's name plate, there is a slight flicker around the backlit letters, while another shot of a taxi pulling away suffers from black-onyellow flicker from the chessboard pattern on its wing. Perhaps there is an issue with fine detailing and the overall picture isn't as fluid as it could be, but these problems are slight and certainly don't interrupt an otherwise enjoyable performance. Despite its flaws, the EH-TW2900 provides a robust and cinematic image that does just enough to impress. 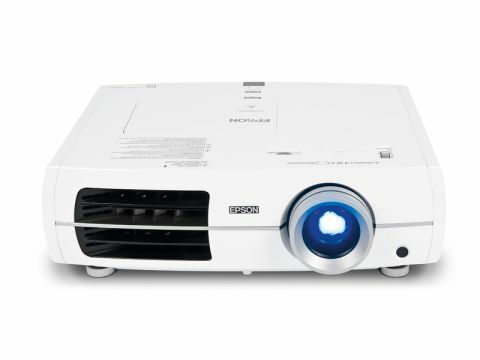 You'll find dearer projectors fitted with more advanced technology to combat film resolution loss, but at just over £1,000, the EH-TW2900's simplicity and versatility make it an enticing and whisper-quiet entry level full HD projector.